Gary Gregg of Creating With Glass gave the classification talk this week. After serving in the military he worked for his brother- in-law at a fixture manufacture firm dealing with architects and designers creating custom fixtures. Gary’s wife Carol is very talented in cutting glass so they started a side business in the early 80s. Gary and Carol went into fulltime business and have never advertised. They receive all their orders from referrals. Gary studied art and design so he does the sales, custom design and installation. Gary did another fantastic show - and -tell and of course his work is beautiful. We saw beautiful beveled and stain glass work. 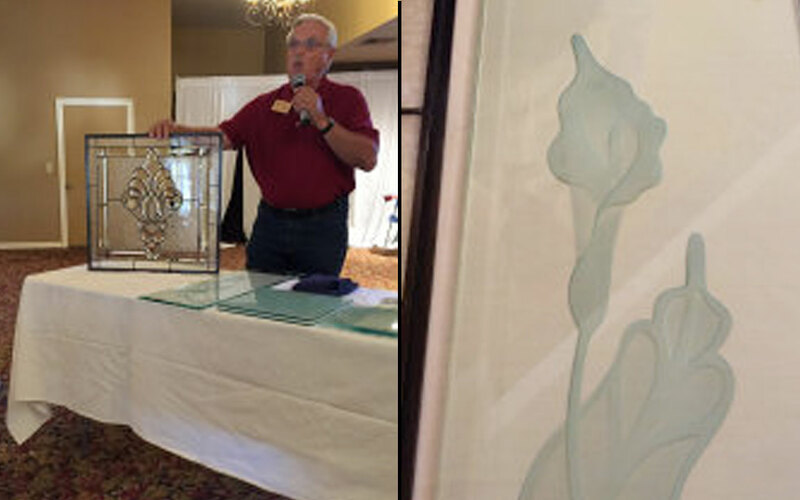 Gary showed examples of copper foil beveled glass, glue chip, carved glass, shattered glass and mirror strip repair. He refurbishes and repairs entry doors (hardware, alignment, cut out existing panels and replaces with glass). He does door lights for kitchen cabinets and side panels, shower enclosure and fire place screens. Gary also repairs old leaded glass windows. 95 percent of their work is residential, but you can see Creating With Glass work in Disneyland at Sleeping Beauty’s castle, Coke Corner and Caesar’s Palace in Las Vegas.